Due to my RSI, I’m taking a complete break from writing for the rest of August. From September, I’ll go back to work on collaborative projects to which I am committed, but I won’t resume working on novels until October at the earliest. My hands are beginning to recover, but I am willing to do what it takes to make sure I never go through that again. Blogging, however, involves the same movements and energy. At first, my thought was to apologise to you all then disappear, but that seemed mean — especially since I haven’t exactly been active recently. I know I owe you all a post about my trip to Ireland, and I will write that for you at some point, but I want it to be long and detailed, so it’s going to have to wait. If I disappear for a month I’m doing you all an injustice, and I don’t like neglecting my readers like that. Therefore, I’m putting out a call for guest posts. They can be about pretty much anything. Writing, reading, and Doctor Who are popular topics on this blog. (And for that last one, there’s plenty to say what with the reveal of the 12th Doctor.) If there’s a TV show you think illustrates a point about plot or characterisation, a book that changed the way you think, or an observation about the world that you want to share, I want to see it! As for those of you who know me from elsewhere other than this blog, if there’s a story you wanted to tell the internet about me then I might be induced to post it… maybe. I won’t post anything that doesn’t fit with my blog in general, but that’s a pretty broad range of posts, so that likely won’t be an issue. I also won’t post anything I perceive as offensive — and everything on this blog needs to be family-friendly. Maybe PG rated. Stay away from copious profanities and the like. Send me your post or an idea for a post via the ‘Contact’ tab at the top of my blog or, if you have it, my email address. I’ll read them and let you know if I can put it up, and at that point we’ll work out what to put on there in the way of a bio and links to your own blogs or websites or whatever. As a guideline, my posts are usually 700-1000 words long. Thanks guys! This is your chance to do me a favour as well as reach out to my readers (though I don’t have a higher-than-average number), so I would greatly appreciate your contributions! 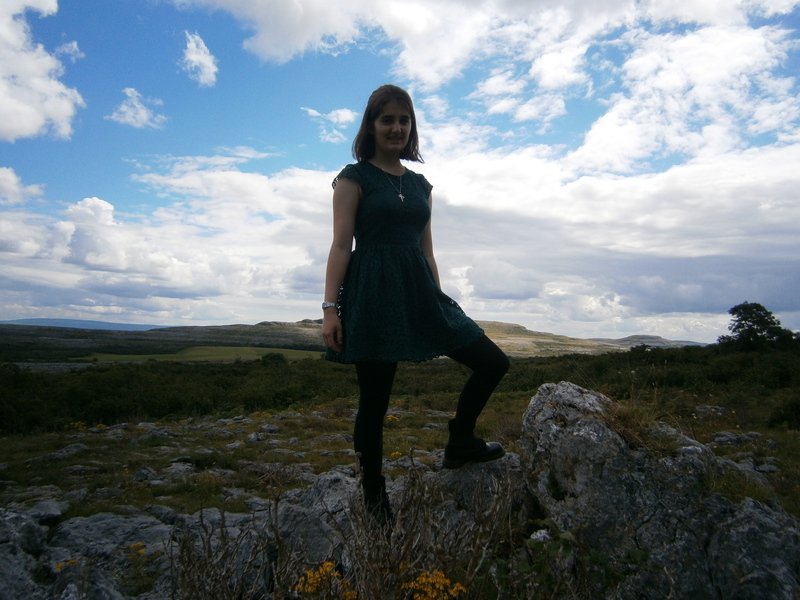 To make up for the delay in a post about Ireland, here is a picture of me standing triumphantly on a rock in the Burren on the west coast of Ireland, approximately an hour after meeting the author Kate Thompson who is a great inspiration to me in all my writing life. Also, that’s so cool that you met Kate Thompson! I don’t actually know who she is, but it’s amazing to meet one’s inspirations. I’ve written about her on here before — I think there was a TCWT prompt about a book that changed our lives (I hosted the chain that month). Find that, and it’ll talk about her! Oh, oh, oh, pick me! I’m very good at humour and sarcasm . . . thinking of post topics, not so much. Cool! I might like to send you something. BUT I’m actually writing this little note to say that you have to at least tell us whether you enjoyed Ireland and whether or not it disappointed you. After your last post on the topic, I’m really curious!